Ocean Park Hong Kong planner is very different from the Disneyland's because the park is bigger with a shorter opening hour. And I didn't exaggerate. It is the fact. It won the Applause Award in 2012 and recognized the World's Best Theme Park. 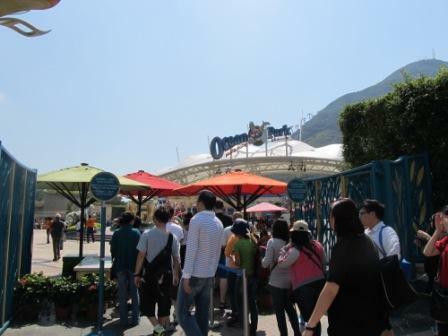 Still, a good Ocean Park Hong Kong planner will help you to get the most out of this great theme park. It is divided by the mountain. To get to the other side, it must be either through the free shuttle bus (I hate to say this. I will never go with the shuttle bus. It's Ocean Park. It got to be the cable car. Who am I kidding? ), cable car or the in-park subway, a.k.a. Ocean Express. Since it has a shorter opening hour, it MUST start out the earliest in the morning. Even though it opens late for special occasion, especially Halloween, you are bound to buy different sets of tickets to visit the park. They call it the day pass and night pass. It is definitely a full-day trip. I highly recommend you to plan on doing it during the weekdays which has a smaller crowd. The best season to visit Ocean Park Hong Kong is fall. You will know what I meant when you sit and watch the dolphins and sea lions show at the Ocean Theatre (coming soon - link to Ocean Park Hong Kong Attractions) under the sun or in winter. Of course, if you travel during the other time in the year, it doesn't mean that you should skip the tour. Besides, you will have more fun in the "Rainforest" region if you are there during summer time. If you go to this theme park during summer or fall time, make sure to bring a light jacket with you, especially if you visit the penguins at the "South Pole Spectacular" (coming soon - link to Ocean Park HK Attractions page). Living in the cold climate for years, even Perry said that it was cold. Getting sick is the last thing you want to happen during your Hong Kong vacation. Except you have something already planned, I highly recommend you to get on the cable car first to get over to the other side of the mountain to start your tour. Attractions over there close an hour earlier than the other side. This is not specific from the theme park official until we found out ourselves. 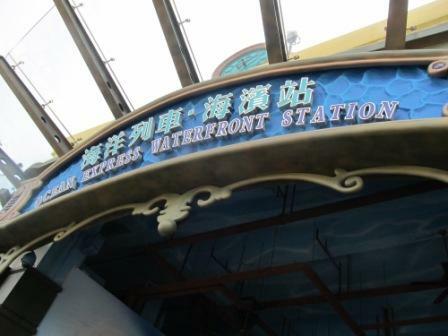 On the same subject, Ocean Park Hong Kong set up "Ocean Express". It takes less time to travel from one mountain to the other. Literally, you don't need to line up at all. I would recommend you to take one of your trips in the train and the other with the cable car. Sitting at the Ocean Theatre, you can overlook what is going on on the other side of the mountain. If you have a toddler, consider if you need a stroller. If so, you must pick it up at the entrance. You can't get it in the middle of the park. Of course, you have to leave it outside at almost every attraction. We brought an umbrella stroller everywhere with us which was very handy, especially with a little kid that needs a nap in the middle of the day. Age matters. All the activities of close contacts with the animals in the park, such as feeding and swimming, are only for children age 11 or above. Same as in Disneyland Hong Kong, bring extra batteries, not the rechargeable ones, and SD card with big memory for pictures and videos. If you can, bring at least a bottle of water per person. There are not many kiosks for snacks and drinks like in Disneyland Hong Kong. The good thing about Ocean Park Hong Kong is that they would not confiscate your bottle of water. Like Disneyland Hong Kong, they take a picture of you and your family in almost every one of their attraction and try to sell you the package. Make your decision quick. My personal experience when it comes to picture taken in Ocean Park Hong Kong, you don't need to line up for so long which is a plus. Bring a back pack with you, you may buy some souvenirs for yourselves, especially if you are visiting "Old Hong Kong". You can put everything in one bag instead of worrying several loose bags. Although with their short opening hour, I would recommend you to stop by one of the restaurants to enjoy a meal. We had a wonderful time in one of their restaurants. For a good Ocean Park Hong Kong planner, it won't hurt to bring some snack with you if you decide not to stop at any restaurants. Of course, it is always good to have a BIG breakfast before starting your day here. When it comes to the sign of showing the duration for lining up for different attractions, this theme park usually overstated it. In some ways, it is good. As of right now, Ocean Park Hong Kong is at least 2 times bigger than Disneyland Hong Kong. 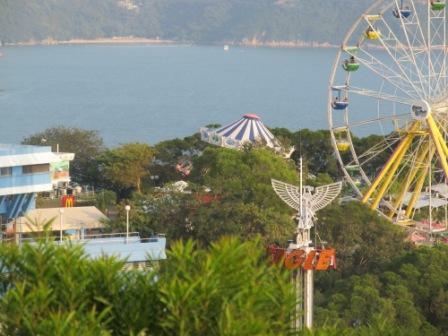 Most of its attractions (coming soon - link to Ocean Park Hong Kong Attractions page) are next to each other. But if you skip some of them, it could be quite a walk away from one to the other. The parking charge is a flat fee for a full day. I highly recommend you to look at the theme park map and the show schedule as soon as you get them. Even if you stand at the same spot for 10 minutes to formulate your Ocean Park Hong Kong planner, you will save yourself at least an hour or two in the long run. Best of all, you won't miss out any opportunity to visit some of the attractions that they close out early on you. To find out more about the schedule and tickets for Ocean Park Hong Kong.